How much fun it would be to see your loved one pleasantly surprised and flattered. Send them out for some work or shopping and in their absence fill their room with balloons and wait for the moment they accidentally walk in! This works best for your halls, whole house or a party venue. This is amazing for your special occasions such as husband’s birthday, your first anniversary, child’s birthday or parent’s anniversary celebrations. You can schedule a CherishX decoration artist to visit your house/venue in the chosen (3 hour) slot. We have slots spread from morning to late evening - see what works best for your surprise. How does my decoration look? About 150 balloons will be hanging from the ceiling with nice ribbons and about 350 on the floor or in form of bunches! The decoration artist will discuss the exact decoration with you and tailor to your taste and your room. The ceiling balloons are stuck with a removable soft tape (tapes with less gum). We don’t use Helium balloons for safety reasons. 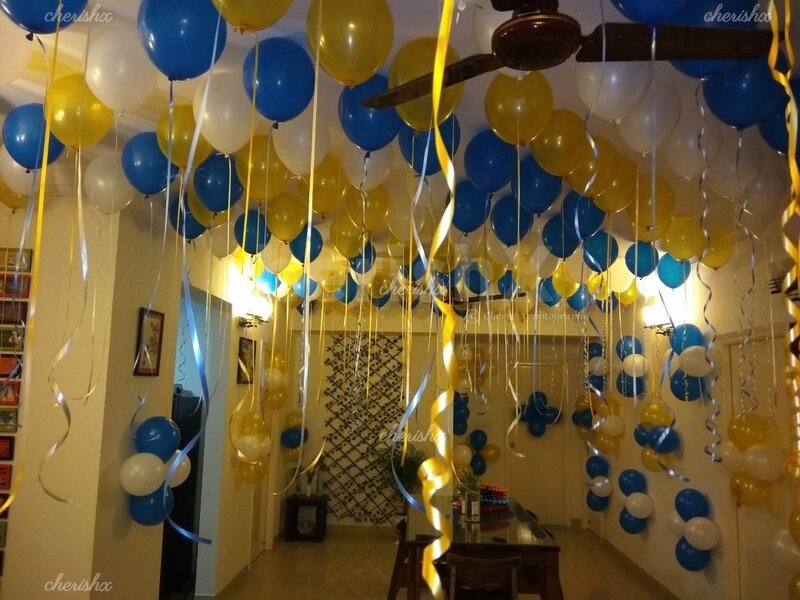 And post your celebration, whenever you want to remove the balloons, just pull their ribbon - in general the balloon will come off without leaving any mark on ceiling (we recommend removing balloon within next 24 hours), however it is always better to be sure if your paint type is right for such decorations. “Candles & flower petal decoration”: for that extra romantic touch. 100 tea light (diya like) candles & lots of rose petals will be use to decorate or write your message. For example on your first anniversary you can have a message - “We are one now”, for husband’s birthday - “Happy birthday my tiger” (or pet name) or for parent’s anniversary - “Happy anniversary mom & dad”. “Add 100 more balloons”: for bigger spaces such as rooftops, large rooms (greater than 15 ft x 15 ft, e.g. living room). 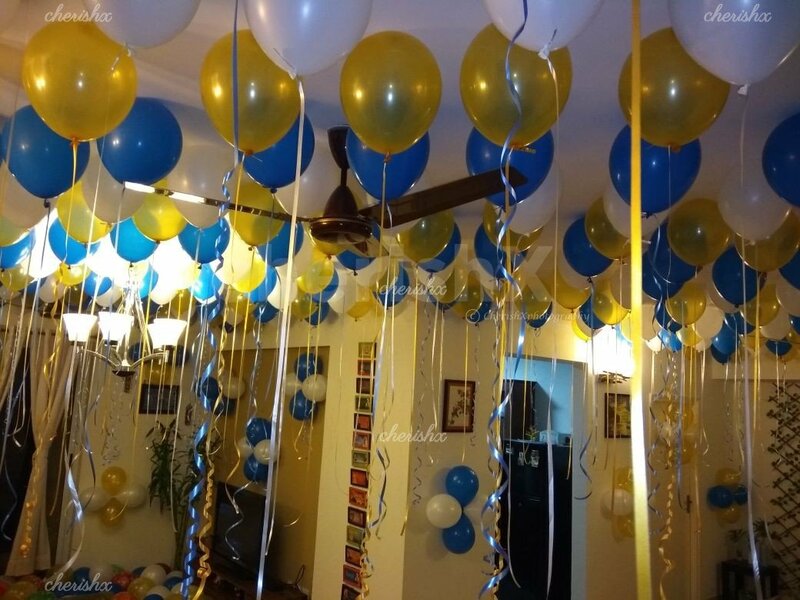 Also the extra balloon can be used to decorate the lobby leading to the room filled surprise balloons. “Movie screening”: if you are a movie lover - then you can organise a movie evening on big screen. We will arrange delivery & pick-up of a projector and large screen (6ft x 4 ft wide). “Guitarist”: for the music lovers & that extra mushy touch. We will send an artist from a local band to play the favourite songs of your partner. Also works great for parent’s anniversary and your daughter’s birthday. “Kids pack” - kids love cartoons! If you select this pack then we send 4 cartoon balloons - ones that your girl or boy loves! 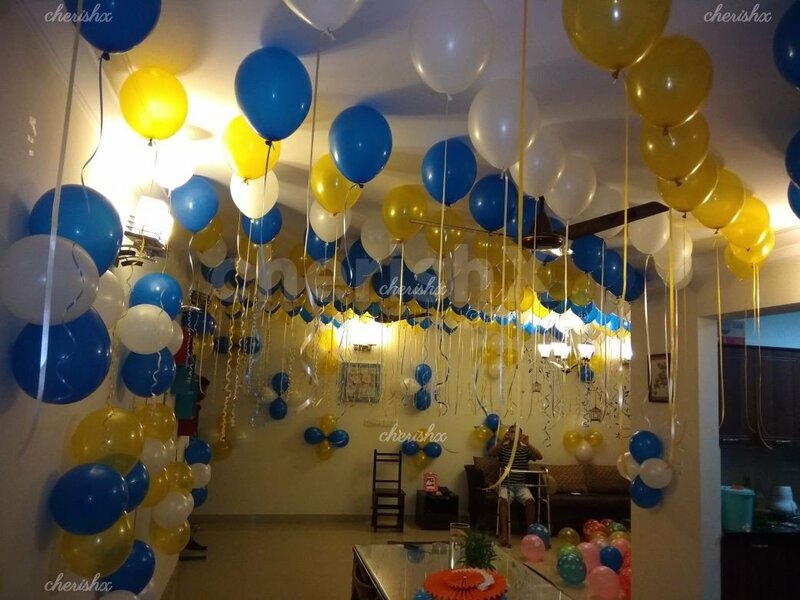 Also we will give the balloon decoration theme from romantic to more fun. Kids love this - works well to surprise them when they return from school! Others: Cake - ½ Kg cake of your choice with your custom message. , Flower bouquet: beautiful bunch of 20 roses. We do not use Helium balloons for home use as it is an asphyxiant - it can suffocate you. We use air balloons, fix them to your ceiling with a removable cello-tape (generally no mark on ceiling but please remove within 24 hours) to create the same experience as helium balloons. Add a small doze of cuteness with this soft and fluffy 2 ft teddy bear. Surprise your loved one with a adorable life size teddy bear. Gift a premium bucket full of beautiful roses as a symbol of love. What is "Candles & flower petals" decoration? In this customization we provide 100 tea light candles and rose petals that can be used for writing a message on the ground as shown in the pictures. After the booking, you are redirected to a page where you need to fill all details like balloon colours, address etc. You may also fill the details by clicking on edit details button in upcoming bookings. What is the quantity of flower petals? What balloon colors do you have? Color options are red, golden, white, blue, grey, violet, orange, green, yellow & more. How much time will the person take to decorate? 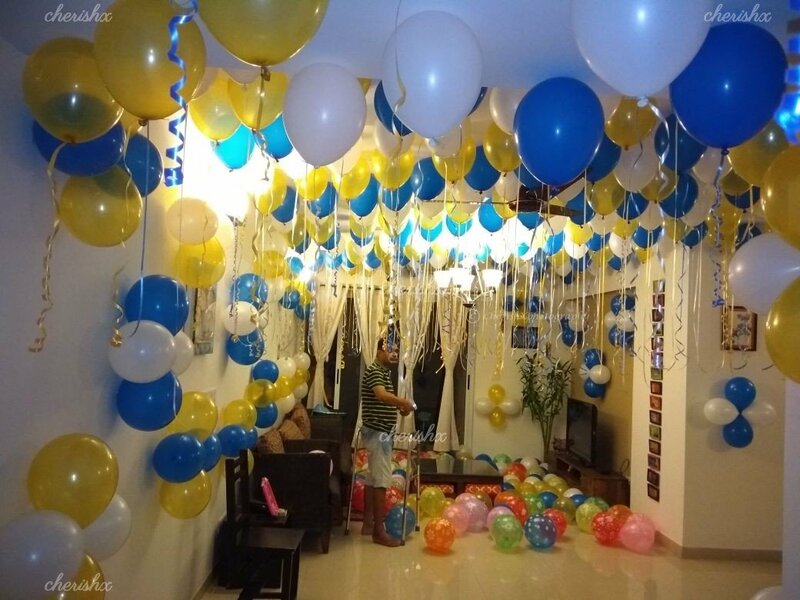 It will take around 45 mins - 1 hour to decorate the place. How many people will come for the decoration? Will you send helium gas balloons? We discourage Helium balloons for home use as it is an asphyxiant - it can suffocate you. We use air balloons, fix them to your ceiling with a removable cellotape (no mark on ceiling) to create the same experience as helium balloons. Where will this be done? Decoration is done at your preferred location ie home, office etc. Can this be done at midnight? Our last time slot is 10-12 PM, decoration will be done in between this time slot.